Fate has a magical way of bringing people together. Take the case of Joe and Hannah, aka Acoustic Eidolon. 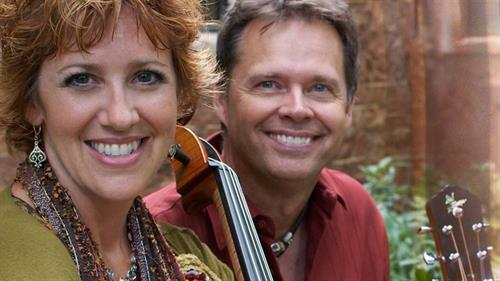 In 1995, Hannah, a studio cellist, received a call to play on a Boulder ensemble’s record. Hannah listened in amazement as directions to the recording studio told her to turn on a small road near her home, and then turn down her own street past her house! Little did Hannah know that across the street and three houses away lived Joe, the greatest double-neck guitjo player in the world (OK, the only double-neck guitjo player in the world). A few years after they met, Joe and Hannah both found themselves between full-time musical engagements. Joe called Hannah, saying he’d always wanted to hear the cello and the guitjo together. He had a feeling the harp-like sound of the guitjo, combined with the warmth of Hannah’s cello, would be beautiful together. So on a snowy day in February 1998, they got together to play for the first time. What happened next was magic. Captivated by the music they created together, Joe and Hannah immediately agreed to clear out their schedules, start rehearsing full-time, and form what would become Acoustic Eidolon. But, fate wasn’t finished with Hannah and Joe. What started as a musical/business partnership and friendship blossomed into their marriage on October 14, 2001. Hannah and Joe (and sons Zach and Alex) became a family. Joe and Hannah joke that this was a marriage of convenience since they were already together all the time anyway! But, anyone watching them perform can feel the love that draws them together. Their love for one another, and their passion for life, speaks through their music. Partial funding is from the Schneider and Cate Funds in the Wyoming Community Foundation-Casper, and Natrona School District No. 1.